The Just Cause 3 trailer went off like a grenade in the middle of today's Gamescom Microsoft press conference. 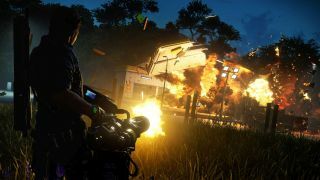 Just Cause 3 shows very nicely in carefully cut together trailers, but is there much besides wing-suiting over explosions to do in Just Cause 3's beautifully rendered jungle islands? Does it even matter if there isn't? JC3 should fill the hole left by Crackdown 3's exclusivity, even if it is daft as a brick. For a deeper look at the island and its destructible elements, check out Sam's hands-on impressions. It's due out on December 1.